Annual Meeting 2015. Great group, great fun! 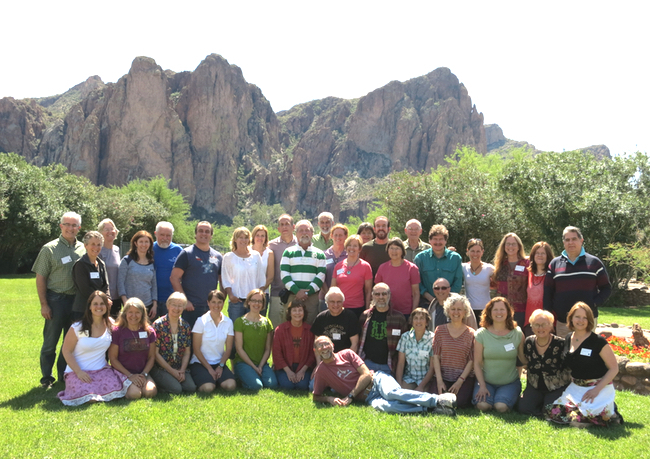 The Pitcairn Institute of Veterinary Homeopathy Annual Meeting in Veterinary Homeopathy is scheduled for February 28 to March 3, 2019 at Saguaro Lake Ranch outside of Phoenix, AZ. This meeting is primarily for veterinarians that have trained with Dr. Pitcairn, veterinarians that are experienced in homeopathy, or qualified veterinary health professionals. Our location is a lovely guest ranch in the desert, just outside of Phoenix. There are small rustic cabins, each with its own bathroom, and a large main house for meeting and meals. March should be rather nice weather and they have a swimming pool, grassy lawn for yoga, trails for hiking and optional horse riding at the stable across the road. The view is spectacular. The “official” meeting is from Thursday through Sunday. There is also an optional day on Wednesday, February 27 (information to follow). We start on Thursday, February 28, at 8:30 AM after a hardy breakfast at the main house. The morning session for the following days starts at 9 AM and go to about 12 noon. Lunch and break will be 2 hours or 3 hours depending on the day’s schedule. Afternoon meeting goes until 6:00 PM. Dinner and free time after this. Sunday we go from 9 AM to 1 PM (with breaks), the meeting ending at 1 PM. Lunch is available for those not needing to leave immediately. If you are coming for the 4-day meeting, then you should plan to arrive Wed. afternoon as there will be a dinner that evening about 6 PM or so. The meal plan includes all meals from Wed. evening through Sunday morning breakfast. The meeting described above is scheduled every hour with speakers and topics. This optional day (Wednesday, February 27) is organized a different way. Richard Pitcairn is the moderator for both sessions. It is an option to come to just this Optional Day if you wish though makes sense to also attend the 4-day meeting since you are here. Morning session (about 9 am to 12 noon): Working with the Wesen of Homeopathy. Seeing beyond the individual. We will dialogue together while sitting on the lovely grass outdoors by the pool. Afternoon session (about 2 pm to 5 pm): Making Practice Efficient. Sharing practical methods of processing information and communications. We will convene in the meeting room for this presentation. If you are coming to this optional day, plan to arrive Tuesday evening for dinner about 6 PM (but this dinner is optional). Susan Pitcairn, MS (social psychology, University of California, 1974) — is co-author of Dr. Pitcairn’s Complete Guide to Natural Health for Dogs and Cats, focussing on its home-prepared recipes, and environmental issues. From 1985 to 2005 she actively assisted in the administration of the Professional Course in Veterinary Homeopathy. Mostly vegetarian since 1971, she and Richard adopted a vegan diet in 2014 after learning about the major impact of animal agriculture on the survival of Earth’s oceans, aquifers, soils, rainforests and remaining wildlife. Inspired by positive reports, she has been investigating and sharing ways that dogs and cats can be healthy on carefully planned meatless diets as well, which offers veterinarians and others to expand their caring to all animals, including the unseen billions now suffering the travails of industrial meat production. Susan is also an accomplished, award-winning Southwest artist. Spirit of the Earth, a volume of her paintings and poems, offers reflections and inspirations to many. Her artwork, poetry and blogs on veganism, environmental issues, science and art are at www.susanpitcairn.com. She has also produced several educational videos on her Youtube channel, SusanPitcairn. For diet handouts, search “Susan Pitcairn diet handouts. Meat consumption takes a high toll on farmed animals and on our planet, and 25% of US meat products go to pets. To address that, we support balanced vegan diets for most dogs and many cats. But wait, soon there will be a new option:“clean meat,” cultured from harmless biopsies and free of antibiotics, hormones and accumulated toxins. It is coming to markets and pet foods soon, and eventually it could spell the end of factory farming — Big Meat is investing! We will also look at new findings on glyphosate and GMOs in pet foods and ways they seem to be undermining health. Rosa Isela Ramírez, MVZ, CVH — I graduated with honors as a veterinarian in 1998, at Universidad Autónoma de Nuevo León, México. I practiced in small animals at a hospital in my hometown for 4 years. In 2003 I started my own practice which became very successful, however I started to feel discontented with the outcome of conventional medicine. In 2009 my daughter was born with several allergic problems. The huge number of doctors treating her soon got frustrated with her case and left us on our own. In 2010, I started doing my own research in an attempt to help her. After several holistic doctors, I found a good human homeopath who changed my kid´s life in good time. In 2014, I returned to work and started practicing a little with holistic medicine and treating my dogs and some patients as well. In 2015, I enrolled at Pitcairn Institute of Veterinary Homeopathy and opened my eyes to a new way of practicing veterinary medicine. Now I treat my patient 100% with homeopathic medicine. These frustrated owners wanted a magical and different treatment for “Luca” who developed new urinary calculi just two months after the first surgical removal. Homeopathic treatment had a surprising outcome. Marybeth Minter, DVM — I grew up in northwest Wyoming and attended the University of Wyoming, earning a BS in Animal Science in 1981. After graduating from the veterinary program at Colorado State University in 1987, I practiced in small and large animal hospitals in the region and in Pennsylvania. I soon became discontented with being a veterinarian, frustrated with the conventional system. I explored other professional avenues, even working in laboratory animal medicine and joining a masters program in public health. During 1999-2001 I completed the CSU veterinary acupuncture and manipulative therapy courses. When I began studying homeopathy in Dr. Richard Pitcairn’s Professional Course in Veterinary Homeopathy in 2003 I somehow felt I was “home” and was finally excited about veterinary medicine; I knew that the practice of homeopathy was where I wanted to focus my energy to help my patients. During this same time, I discovered and was surprised to learn more about the legacy on my mother’s side of the family. Six relatives were homeopathic medical doctors who attended Hahnemann Medical College in Philadelphia, including my great grandfather who practiced homeopathy during the 1918 flu epidemic. I started Mariposa Veterinary Service in Jackson, WY in 1998 as a house call practice. After life changes and long winters, I relocated the practice to Sedona, AZ and continue to offer house call services. “Velvet” and “Ishmael” had both been recently adopted at a mature age. Not much was known about their previous histories. Both had been treated allopathically after adoption. They initially presented with skin symptoms focused to a certain location on their bodies, which proved to be the most helpful guide in remedy selection. Lisa Melling, DVM, CVH — received a Bachelor of Science degree in Animal Science from Iowa State University in 1999 and graduated from Tuskegee University School of Veterinary Medicine in 2004. In 2007, Dr. Melling co-founded Best Friends Pet Wellness, a house call practice serving the Ann Arbor area of Michigan. Dr. Melling became an instructor for the Professional Course in Veterinary Homeopathy in 2010 and a Certified Veterinary Homeopath by the Academy of Veterinary Homeopathy in 2011. In 2015, Dr. Melling moved to Traverse City, Michigan and established Good Harbor Holistic Veterinary Care, which provides homeopathic treatment for acute illnesses, injuries and chronic disease as well as nutritional advice and behavioral counseling. In spite of condemnation by the allopathic community that homeopathic medicines are nothing more than a placebo, we are shown time and time again that our animal patients respond curatively to these remedies. In fact, the patients who have suffered the least amount of allopathic intervention often have the most rapid cures. This presentation will discuss several cases of homeopathic cures across species, highlighting the simplicity of homeopathic prescribing and the honesty of animal responses to remedies. Laura Weis, DVM — graduated from Cornell University with a BS in Biology, and from the Virginia Maryland College of Veterinary Medicine in 1998 at the top of her class. She worked in small animal private practice in Pennsylvania for 14 years, purchasing a tiny practice two years after graduation with her husband, also a veterinarian. While loving patient care and staying at the forefront of practice and surgery, Dr. Weis grew frustrated with the tools and options of allopathic medicine. She channeled her frustration into studying practice management and leadership strategies, growing the veterinary hospital and purchasing a large pet care facility. Her husband developed debilitating health issues in 2006 following repeated exposure to pesticides used as accelerants in surgical gloves, and conventional medical options were poor. Searching for answers, Dr. Weis began an intensive study of nutrition, which then led to exploring holistic medicine and learning about homeopathy. After completing the Pitcairn Institute of Veterinary Homeopathy course in 2016, she now loves practice again, and almost exclusively uses homeopathy and nutrition to help her patients. Dr. Weis shares her home in Pennsylvania with her husband (who is greatly improved and a passionate advocate for homeopathy), three teen sons, and a circus of dogs, cats, goats and chickens. Hundreds of cases of canine respiratory disease were described in the late summer and early fall of 2018 in the eastern United States. The causative agent was not identified. I treated 16 dogs presumptively infected while boarding, identifying two primary remedies based on the symptoms displayed by several of the dogs. These remedies were also used to treat boarding dogs showing very early signs of disease, and used prophylactically in a busy dog daycare population. Wendy Jensen, DVM, CVH — has been practicing 100 percent homeopathy since 1992. She graduated from the New York State College of Veterinary Medicine in 1987, before being certified by the Academy of Veterinary Homeopathy (AVH) in 1994. Dr. Jensen served as Executive Editor for the AVH’s Journal (JAVH) for 12 years. She lectures extensively and has taught and served as a mentor for the Pitcairn Institute of Veterinary Homeopathy’s Professional Course. Her writing has appeared in JAVH and JAHVMA, as well as in other journals. Together with Dr. Richard Pitcairn, Dr. Jensen wrote the New World Veterinary Repertory. Her own book, The Practical Handbook of Veterinary Homeopathy: Healing Our Companion Animals from the Inside Out is required reading for the Professional Course. She lives in New Hampshire and plays violin whenever she can take time out from her busy house call practice. While we don’t know what our patients are thinking, we can make a calculated assessment as experienced observers. Knowing what emotions predominate in our patients, and how these emotions impact the case, offers another guide to the curative remedy. Is it part of the normal mental state of the patient, or is the patient truly ill on an emotional level? We will explore carefully using emotions to guide our case analysis. How can we use ReferenceWorks to improve our accuracy in homeopathic practice? Searching for key terms in order to compare across remedies is simplified using a computer program. Remedies are more easily studied this way as well, thus growing our knowledge and bringing materia medica to life in our minds. We will explore the use of ReferenceWorks to develop our mental remedy pictures, narrow choices in a case, and determine the exact best match for our patients. Paul Rowan, DVM — I graduated from UC Davis in 1967. I did an internship and residency at the Animal Medical Center in NYC and followed that with a year as a Fellow in Cardiothoracic Surgery at Mt. Sinai Hospital in NYC. A few years later I opened the first feline only practice in NYC at the time. I sold the practice 5 years later, worked as a surgeon for practices in Brooklyn and Long Island before moving to Virginia. I had a large conventional practice in Virginia Beach until selling it 15 years ago to establish the Center for Animal Healing a strictly chiropractic practice for animals. I had taken the basic and advanced courses in Animal Chiropractic and then served as the original Chairman of its Board of Directors and first President of the American Veterinary Chiropractic Association. How I’ve worked to devise a relatively simple and effective solution to remedy selection with selected case studies. MaryAnn Skillman, RN, BSN — has had a long career as a scientist, clinician and researcher. She started her applied science career in the 1970’s with EPA research examining the acoustic effects of noise pollution and mitigation options. She continued her career with clinical training as a medic and nurse corps officer in the military services, completing a BSN at American University, then worked on and publishing multiple studies in the fields of anesthesia and neurobiology. She worked in Neurointerventional radiology at Georgetown University medical center for a decade, followed by extensive training in Europe in Structural Integration, anatomy, and various interventions and modalities used in Osteopathy and manipulative therapies. She also has experience with classical modern dance, which informs her ability to work dynamically in various formats with humans and animals, with a deep understanding of movement. This has informed her work as a clinician, scientist and budding homeopath. Ms. Skillman developed her strong interest in homeopathy after the tragic death of a rescued donkey on her organic farm. She came to the realization that traditional Veterinary medicine was not offering the depth of treatment to really provide curative care. This led her to the study of homeopathy and to her training at the Pitcairn Institute. She has completed the Pitcairn Institute of Veterinary Homeopathy course and is practicing on her organic farm in South Central Kentucky. In the spring of 2017 and 2018, a nearby farm used excessive volatile chemical sprays for a large GMO tobacco operation. The drift carried onto a 67-acre certified organic farm nearby. Multiple herb plants, rose bushes, blueberry bushes were killed, trees damaged and 2 animals (rescued donkeys) died, with the remaining animals showing symptoms. Lab testing revealed extremely high levels of toxic chemicals. This presentation will detail how the individual animals, the herd, the owners and amazingly the entire farm itself responded to homeopathic remedy treatment over a 12-month time frame. Richard Pitcairn, DVM, PhD — Graduating in 1965 from UC Davis, Dr. Pitcairn first practiced with a variety of animals — livestock, farm animals, circus animals, and pets. After two years, he took a position on the faculty at Washington State University. After teaching and operating the Large Animal Clinic for a year, he entered graduate school in the department of microbiology. Seven years later, graduating with a PhD in immunology & biochemistry, he again joined the faculty to teach and do research during which time an interest in nutrition developed and led him to re-enter practice to put nutritional therapy to a practical test. In 1978, a beginning interest in homeopathy resulted in a dramatic recovery from influenza. Bed-ridden on Thanksgiving Day, and suffering from a headache, unable to eat, nauseated, and weak, Dr. Pitcairn, as best he could, perused the homeopathic book he had brought with him, reading the remedies for influenza. Recognizing Gelsemium as the appropriate remedy and having a small kit with him, with trembling hand he took a few pellets. Within 15 minutes, with a complete restoration of health, he was at the table with the rest of the family enjoying the holiday. In 1985, a clinic was established in Eugene, Oregon which, for over 20 years, offered only nutritional therapy and homeopathic medicine. With time, he began teaching others in this method, establishing a year long post-graduate training program for veterinarians which is still ongoing and has graduated 500 veterinarians trained in homeopathic practice. In 1995 he was one of the founders of the Academy of Veterinary Homeopathy, the first veterinary homeopathy professional organization in the United States. In 1982, Dr. Pitcairn, with his wife Susan, published a book on natural animal care that is still in print, as the fourth edition, having sold over 500,000 copies. 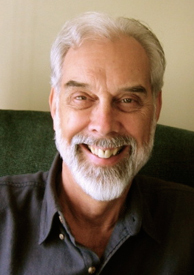 Now retired from practice, Dr. Pitcairn focusses on writing, teaching and research in homeopathy. In a case from 1889 a severe case of Canine Distemper is treated successfully with one remedy. The case is remarkable in that the most characteristic symptom is not readily found in the usual sources. An attempt to identify the remedy is demonstrated. Exploring the historical elucidation of this remedy, its development from provings into clinical experience. A case from 1889 gives us insight to another rare symptom. We try to find that information in our reference material as an exercise in the study of materia medica. We move from seeing this remedy work in this prior case to how this can be a basis for materia medica learning. James Tyler Kent, MD is a major figure in the development of homeopathy into what it is today. He is a promoter of the use of higher potencies and more than anyone else embraced and extended the metaphysical teachings of Hahnemann. We will study his method. Preference for potency of the medicine used has been an ongoing concern for many practitioners. Historically there has been considerable fluctuation. We will explore the influence of Richard Hughes, MD, its effect on how homeopathy was practiced, and example cases. Considering the role of micro-organisms in disease from a homeopathic perspective we see that the context of the homeopathic method considers the patient differently. How disease manifests, including what are usually considered the infectious agents, is part of that patient view and plays a subordinate role. Domestic dogs, though derived from wolves, have been considerably changed from this earlier manifestation. That these changes have happened is significant in recognizing the most useful constitutional remedies for dogs. Dr. Samuel Hahnemann emphasized using all the symptoms of the patient in determining what was the appropriate treatment. What was meant by this and why was it emphasized? Tuition for the 4 day meeting is $725 if by check (made out to ANHC Education Programs and sent to 7149 Lantana Terrace, Carlsbad, CA 92011). (If paid in Canadian or Mexican currency then $625 US). If by credit card it is $753 and after you register you will be sent an email invoice with the option of paying through PayPal. You need not be a member of PayPal to use this service. (If paid in Canadian or Mexican currency then $653 US). Tuition for the optional day, Wednesday, is $181 if by check (as above) (Canadian or Mexican currency $156 US). If by credit card $188 (Canadian or Mexican currency $163 US). Tuition for optional day + 4 day meeting = $906 by check (Canadian or Mexican currency $781 US); or if by credit card $941 (Canadian or Mexican currency $816 US). If you register and then cannot make the meeting, you can receive a refund less $50. Please do let us know as soon as you can if you have to change your plans as the closer we get to the meeting, the more awkward for us in terms of meal planning. There is a separate charge for staying at the ranch. They ask us to organize the lodging and collect payment which we then give to the ranch at the time of the meeting. The Pitcairn Institute of Veterinary Homeopathy does not add any charges to this (other than 4% for bank fees & bookkeeping) and the prices reflect what we will be paying the ranch for their service. The prices listed below includes the lodging & meals provided, including the tax. Triple rooms, price is $174/night lodging, meals & day use; $695 for 4 days; $868 for 5 days. Double rooms, price is $192/night lodging, meals & day use; $769 for 4 days; $961 for 5 days. Day use only (including lunch), price is $43/day or $172 for 4 days; $215 for 5 days. Children, ages between 7 and 17, price is $93/night lodging, meals & day use; $372 for 4 days; $465 for 5 days. Children, ages 3 to 6, price is $37/night lodging, meals & day use; $149 for 4 days; $186 for 5 days. Children under age 3, no charge. * There is a very limited number of single room options. We assign the few available based on the dates of registration — precedence to the early registrants. If you request a single and it is not available we will get in touch with you and look at the option of doubling with someone and see if you still want to do it. Note: We veterinarians practicing homeopathy have focused on the goal of alleviation of suffering in our patients and many of us, along the way, have come to the realization that for this goal to be achieved this focus must include all of our brothers and sisters. We cannot be partial in the sense of extending compassion to certain animals while ignoring what is happening to the rest of the animal kingdom. While not all have taken this step, those of us putting on this program have chosen to make the gesture of providing a primarily vegan menu at the ranch. There will be some choice exceptions for those not ready for this, but almost all the dishes will be made without requiring the suffering or death of animals. We have offered this menu the last four years and those attending have found it quite enjoyable. It is also an option to stay off ranch if you would rather. Closest is Fountain Hills (8-10 miles from the ranch). However, rates in March tend around $129-$159 or higher, so the rates at Saguaro Lake Ranch which include meals may be a better option. I searched in Google for “hotels in fountain hills arizona” and found about 7 hotels listed there. Phoenix is farther, about 45 minutes or so, depending on traffic. If flying, come to the Sky Harbor Phoenix airport. The ranch is outside of Phoenix proper, about a 30-40 minute drive and one option is to rent a car. However, once at the ranch there is really no need for a car so it may be easiest to use the available taxi services. George Transportation, (602) 509-6669, charges by number of people, so check with him on rates (last time it was about 80-100 for a group, one way). A limitation will be the amount of luggage you have so I anticipate 2-3 people sharing that ride is a practical limit. By appointment. Of late, some people have taken Uber. We do not know of cost or reliability with this option. If you are driving, the address for the ranch is 13020 Bush Highway, Mesa, AZ 85215. You can check their web site for information and a map. You can register online and indicate what days you will be attending and the lodging requested. When you complete the registration form it is transmitted to us and we keep track of your information and will get back to you with more detail on travel and what to bring. Closer to the meeting, usually about 3 weeks out, we assign lodging and send you an invoice for that part.